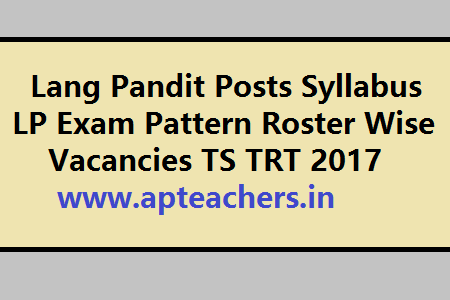 Lang Pandit Posts Syllabus LP Exam Pattern Roster Wise Vacancies TS TRT 2017. Language Pandits Posts Vacancies District Wise, Post Wise, Roster Wise and Community Wise are released vide Notification No 54 dated 21.10.2017. TEACHER RECRUITMENT TEST IN SCHOOL EDUCATION DEPARTMENT LANGUAGE PANDIT. Lang Pandit Telugu Syllabus, Exam Pattern, Qualifications.Lang Pandit Urdu Syllabus, Exam Pattern, Qualifications. Lang Pandit Hindi Syllabus, Exam Pattern, Qualifications in TS TRT 2017.
ii. Must possess 4-year B.A.B.Ed / B.Sc.B.Ed. Integrated degree with at least 50% marks (In case of SC / ST / BC / Differently abled candidates, the minimum marks shall be 45%) with Telugu as a Methodology from any institution recognised by NCTE. AND Pass in Paper II of Telangana State Teacher Eligibility Test (TSTET) / Andhra Pradesh Teacher Eligibility Test (APTET) / Central Teacher Eligibility Test (CTET) with i. Mathematics and Science or ii. Social Studies as Optional. Same will be other Lang Padit Posts also. More details download the PDF File Below. Kautilya Careers provides ap dsc preparation material. Our ap dsc sgt online preparation assist the AP DSC SGT Aspirants to crack the exam easily. We provides the excellent ap dsc sgt study material in telugu pdf. To check your skill we aslo provides ap dsc online mock test in telugu. Visit kautilyacareers.com and Enrol today to join online coaching and access online material.